Go to a bar and order a Martini and you will get an actual Martini with, perhaps, just some cheap gin, but it’s still a Martini. Go to a bar and order a Mai Tai and 8 out of 10 times you will get a blend of juices shaken with some rum and served in a glass with an umbrella. It will be nothing that resembles the actual Mai Tai that was created around the ‘40’s. The Mai Tai has an interesting history that was somehow lost in modernization, as was the recipe. Nowadays, cocktail aficionados are bringing back the original flavors of the Mai Tai and bringing justice to its history. The tale of the Mai Tai started in 1944, according to Trader Vic. Victor Jules Bergeron, better known as Trader Vic, was the owner of a tiki restaurant of the same name. Together with Donn Beach, from Donn the Beachcomber, they were the first one to start the tiki culture. The tiki culture is a blend of the Polynesian and the Caribbean. It was a place where people could escape reality and be transported to the tropics while enjoying tropical flavored cocktails. The cocktails were a careful combination of tropical flavors like lime juice, curaçao liqueur, and Caribbean rum. Trader Vic tells the story of the day he was serving two friends, Eastham and Carrie Guild from Tahiti, at his restaurant in Oakland. Inspired by the simplicity of successful drinks like Martinis, Manhattans, and Daiquiris he set himself to create a new exotic rum drink. “I took down a bottle of seventeen-year-old rum. It was J. Wray Nephew from Jamaica-surprisingly golden in color, medium bodied, but with the rich pungent flavor particular to the Jamaican blends”, he writes in his book Trader Vic’s Bartender’s Guide. This specific rum needed to be combined with something that didn’t overpower its taste. He took a fresh lime, some orange curaçao, a dash of rock candy sugar, and a bit of French orgeat syrup. He shook the mixture with shaved ice, placed half the lime shell on top of the drink and added a branch of mint to it to represent an island. He served this drink to its friends and after Carrie took one sip of it she said, “Mai Tai-Roa Aé,” which means “Out of this world-the best” in Tahitian. There is where he decided to call the drink Mai Tai. Cut lime in half; squeeze juice over shaved ice in a mai tai (double old-fashioned) glass; save one spent shell. Add remaining ingredients and enough shaved ice to fill the glass. Hand shake. Decorate with spent lime shell, fresh mint, and a fruit stick. Due to the initial popularity of the Mai Tai the 17-year-old rum, J. Wray Nephew, became scarce so Vic decided to trade it for a 15-year-old rum. Eventually, the 15-year-old rum also started to become scarce which made Vic have to adjust his recipe not once but twice. He started making the Mai Tai with a mix of his own rum, a Jamaica rum, and Martinique rum. 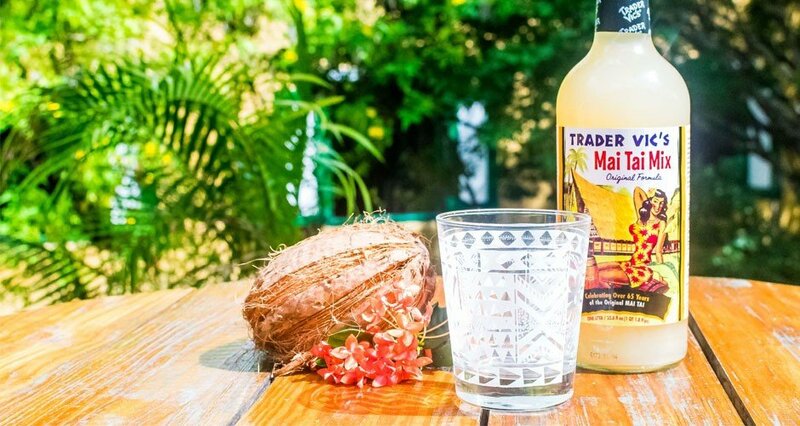 Trader Vic Mai Tai recipe calls for AOC Rhum Agricole from Martinique, but many people claim that Trader Vic would have actually used a Rhum Traditionnel, Rhum Negrita. He started making the Mai Tai with a mix of his own rum, a Jamaica rum, and Martinique rum.Important is that the rum should be well-aged and have a “nutty and snappy” flavor. When making a Mai Tai, experiment with different types of rums to find the perfect blend that comes close to the original flavor. In the original recipe, Vic used an orange curaçao from the Netherlands. During this period the curaçao’s from Amsterdam were made with the peels of the bitter Laraha orange from Curaçao. Nowadays, most curacaos come from the Netherlands or France but are not made the same way as back in the days. In the past, most liqueurs were made with the dried peels of the Laraha, a bitter fruit from Curaçao. To come close to the original taste it's important to have an orange curaçao that is made the same way. The only Curaçao Liqueur that is still made in the traditional way is the Senior Curaçao Liqueur. The simple syrup needs to be made with good quality organic cane sugar. The original was a rock candy syrup which is water that is supersaturated with sugar. But there are also other ways to make the sugar syrup. Martin Cate’s book, Smuggler’s Cove, call for Demerara syrup instead of rock candy syrup. Trader Vic's added orgeat syrup (pronounced: owr-zha) to the Mai Tai to get a hint of almond flavor. Orgeat syrup is sweet syrup made out of sugar, blanched almonds, and rose water or orange flower water. Orgeat syrup is used in my tiki cocktails because it blends really well with citrus flavors and gives a nice nutty taste to cocktails. Then it comes down to the presentation. A Mai Tai is always served in a double old-fashioned, which is a 12 oz wide and short glass with a thick base. The shell of the lime that was used for the cocktail has to be placed on top of the drink with the green side up and with a branch of mint. The idea behind this garnish is that the mint and lime represents an island. Beat the mint in your palm or on your fist to let the aroma of the mint come loose. 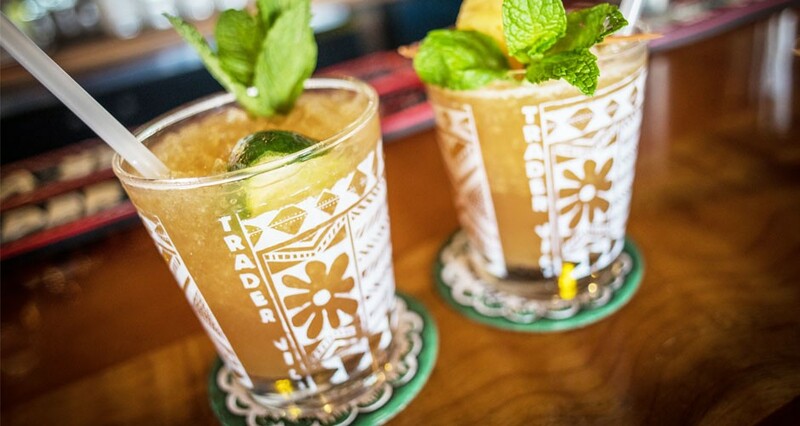 Trader Vic had to travel to the Hawaiian Islands with the Matson Steamship Lines to create the drinks at their Royal Hawaiian and Surfrider hotels. The Mai Tai was such a success in America that Trader Vic decided to introduce the Mai Tai to the Hawaiian Islands. It was during this time that he added orange and pineapple juice to the cocktail to make it more tourist-friendly. That was the birth of the Royal Hawaiian Mai Tai. Unfortunately, this recipe became highly popular and overshadowed the original well-balanced taste of the Mai Tai. The Royal Hawaiian Mai Tai became so popular that nowadays bars still sell the Royal Hawaiian Mai Tai as a traditional Mai Tai. If you ever see a recipe that calls for orange juice, pineapple juice, orange curaçao light rum, and dark rum remember that this is the Royal Hawaiian Mai Tai and not the traditional one. After the introduction of the Royal Hawaiian Mai Tai, bartenders started experimenting with the recipe and developed their own variations. These variations are still served in many (tiki) bars and bartenders are still developing these variations recipes even further. Take for example Trader Vic's tiki bar. If you ever visit their bar you'll find a Mango Mai Tai cocktail or a Guava Mai Tai on their menu. Martin Cate, from the tiki bar the Smuggler's Cove, adds chilled sparkling wine to the original recipe to make his Sparkling Mai Tai.